The calls are absolutely beautiful! The craftsmanship is excellent." Hunting has been a way of life for me since I grew up on the family farm in Southern Illinois in the early 50's. I grew up hunting rabbits and squirrels; there were no deer to speak of and turkeys were something that I saw in the outdoor magazines. I started hunting turkeys during the first Illinois season in Union County. I went 3 years without killing a bird, not because there were no birds, but because I was too ignorant to kill one. My setup and calling skills were nonexistent. I still have the Penn's Woods box call I had then, retired in my collection. I didn't hunt turkeys for several years, until my hunting partner of about 30 years asked me if I wanted to learn to hunt turkeys. He had a father-in-law who lived in Missouri and also a brother-in-law who was a pretty good turkey hunter. They taught me more in one season about turkey hunting than I had learned in 3 years of being on my own. A desire to succeed at whatever I do drove me to learn as much as I could about America's greatest game bird. Books by McIlheny, Davis, Bailey and others, helped me get a historical as well as a practical knowledge bank started. I haven't looked back since. I have enjoyed making things since I was very young, so making turkey calls was a natural offshoot of the sport. Many of my early calls were given away unsigned. Some worked, some didn't, but I had fun making them. I met a fine gentleman named Wayne Bailey on a hunt in the Arcadia Valley of Missouri. Wayne took bones from a nice gobbler I had killed and made a 3 bone wingbone call for me. I never forgot the kindness. I now make all kinds of wingbone and turned barrel yelpers, as well as tube calls, and a very few slates & scratch boxes, as well as turtle shell calls, Swiney Rayfield calls, box calls, and a trough call. I also am beginning to offer seminars on turkey hunting geared to teach not just impress others. Too many of the people out there are interested only in ego inflation and the dollar rather than really teaching others to hunt effectively. I have learned a lot from many people and the turkeys themselves, and I am still learning today. When I quit learning from the turkeys I'll give up the sport. I've add archery hunting to my fall turkey season. It lets me add days afield. I target only gobblers so it compounds my problems in a good way. I've learned different techniques to use in the fall that would not always work in the spring. Since this site was introduced, I've been fortunate to win several prestigious awards. At the 2000 N.W.T.F. callmaking contest, I was fortunate to win all three of the Best-of-Show awards. A feat that has never been done in the history of the contest! 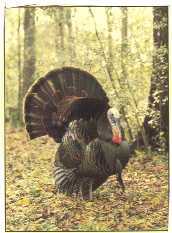 The First Best-of-Show call was the first call to be placed in the Wild Turkey Museum in Edgefield, S.C. In 2005 my Wing Bone Call won the Jordan Award at the N.W.T.F. National Call contest. I've won over 100 First Place ribbons on my calls at the Nationals. Philosophical ramblings: Hunters should savor the hunt rather than the kill. Good friends and acquaintances are worth far more than turkey records. Revere the bird you take; he represents thousands of years of evolution, and unlike the dinosaur, he's still here. Patience and confidence are the best pieces of equipment you can take on a turkey hunt, and you can't buy either of them in a store. Don't quit hunting 'til the last legal minute; success can come at any time. Learn to use as wide a variety of calls as you can; versatility can save the day. Don't underestimate your quarry. I believe that indescriminate killing will be the end of our sport unless we change back to ethical hunting and all that it entails.